GREAT OCEAN VIEWS! Access the beach using your own private path directly to the beach! Less than 300 feet from the ocean. Hours of fun await you at SEAVUE! Relax in the new landscaped pool area and enjoy your much deserved vacation! Enjoy beautiful furnishings featuring original Outer Banks oil paintings by local artists. 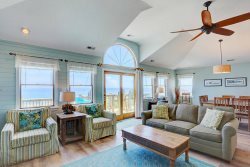 Step back into time on the 500 square foot Old Nags Head style covered porch overlooking the pool area. Enjoy the famous Outer Banks sunsets while relaxing in the hammocks and outdoor wicker sofas. Feel the ocean breezes from the new crow’s nest with built-in seating where you will be able to experience some of the most magnificent views in the area and watch the Pelicans over the Atlantic! Whether you enjoy ocean side, poolside, taking a nap in the hammock, or ping pong with family and friends...we have you covered at SeaVue. This cottage has been beautifully updated with a new kitchen, dining table that seats 10, ceiling fans, 2 Queen size Sealy Posturepedic Beds, 1 bunk and 1 twin. Enjoy a convenient 1/2 bath on the ground level with outdoor shower, dressing room, extra refrigerator, and fish cleaning station. Need to stay connected to family and friends? WIFI is included. Also, a flat screen TV, VCR and DVD player. The bicycle and walking paths that lead to shopping and restaurants are across the street. Enjoy early morning walks throughout the scenic meandering paths that lead through Southern Shores. Visitors to SeaVue will have ACCESS to all of the amenities offered by Southern Shores Civic Association including parking passes to beach and sound areas, a MARINA, and wonderful community tennis courts. Come and enjoy SEAVUE and see why our guests come back year after year!